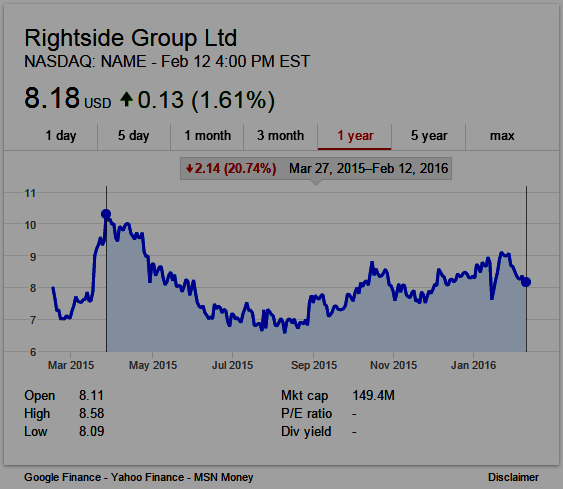 Rightside Group, Ltd. (NASDAQ:NAME), a leading provider of domain name registry and registrar services, will release Q4 and full year 2015 financial results after market close on February 16, 2016. UPDATE: Rightside Group's (NAME) CEO Taryn Naidu on Q4 2015 Results - Earnings Call Transcript | Seeking Alpha: Sameet Sinha of B. Riley:"... looking at your guidance, I mean, you're kind of implying basically mid-point of next year's guidance will be half of what you grew in '15. So what do you think is causing that slowdown, I mean obviously seeing the registrar, the wholesale business is slowing down, registry is at least below our expectations, anything, any specific trend that you wanted to call out or anything that we should be cognizant of?" Note: see accompanying notes in the Earnings Release. Registrar services revenue increased 6% to $44.7 million compared to $42.3 million. Registry services revenue increased to $2.5 million compared to $1.1 million. Aftermarket and other revenue was $9.3 million compared to $8.6 million. Total revenue increased 8% to a record $55.7 million compared to $51.7 million. Net loss was $4.1 million, compared to net income of $1.5 million. 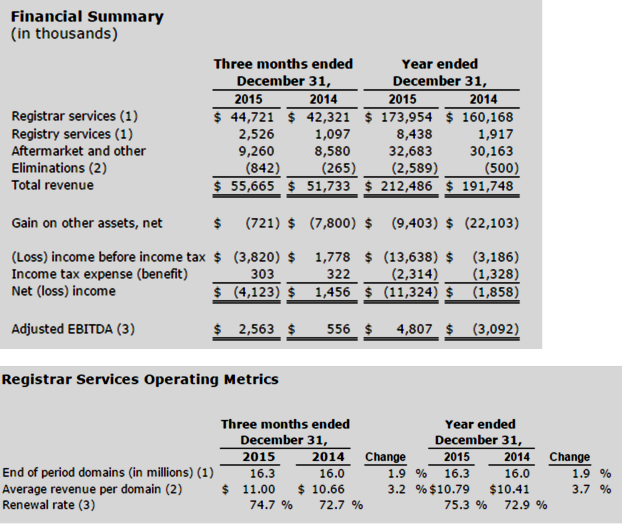 Adjusted EBITDA was $2.6 million, compared to $0.6 million. Gain on other assets, net was $0.7 million representing fewer withdrawals of its interest in gTLD applications during the period compared to a gain of $7.8 million. Registrar services revenue increased 9% to $174.0 million compared to $160.2 million. Registry services revenue increased to $8.4 million compared to $1.9 million. Aftermarket and other revenue was $32.7 million compared to $30.2 million. Total revenue increased 11% to a record $212.5 million compared to $191.7 million. Net loss was $11.3 million, compared to $1.9 million. Adjusted EBITDA was $4.8 million, compared to Adjusted EBITDA of ($3.1 million). Gain on other assets, net was $9.4 million representing fewer withdrawals of its interest in gTLD applications during the period compared to a gain of $22.1 million. Rightside's 39 owned and operated gTLDs in general availability ended 2015 with over 400,000 registered domains, up 14% over Q3 2015. Rightside's retail registrar, Name.com, grew revenue over 25% year over year with over half of that growth driven by higher margin new gTLDs. With over 16.5 million total domains under management as of December 31, 2015, including over 2.8 million domain names registered through its retail outlets, Rightside remains one of the world's largest registrars. Strong momentum behind Rightside's most recent launches - with the fourth quarter's .LIVE and .STUDIO topping 25,000 combined registrations and .NEWS, which launched in the third quarter of 2015, now has over 60,000 registrations and is in the top spot in Rightside's portfolio. As of December 31, 2015, Rightside had cash and cash equivalents of $45.1 million, compared to $45.9 million as of September 30, 2015. At the end of the fourth quarter, the Company had letters of credit totaling $11 million outstanding with approximately $19 million of available borrowing capacity under its revolving credit facility with Silicon Valley Bank. Total revenue of $218 million to $228 million, inclusive of $12 million to $15 million of GAAP revenue from our Registry Services Business. Total Adjusted EBITDA of $8 million to $11 million, inclusive of approximately $2 million of incremental discretionary marketing spend for the year. According to ntldstats.com, Rightside is the 9th largest new gTLD registry operator with 3.45% market share although it operates 4.39% (40) of all new gTLDs. For details of Rightside's new gTLDs, including number of domain name registrations per new gTLD, go here. In addition to being a new gTLD registry operator (Rightside Registry), Rightside operates other brands in the domain name industry, including eNom, Name.com, and NameJet. Headquartered in Kirkland, WA, Rightside has offices in North America, Europe, and Australia. For more information: www.rightside.co.